Head to Northern France to take advantage of its unique Christmas shopping and festive gift inspiration, whether your tastes run to gourmet food or delicate lace. Just a short hop across the Channel, Northern France is a wonderful place to get into the festive spirit. Spend precious time together at warmly welcoming events and learn about regional heritage while meeting local producers firmly embedded in the history and landscapes of this compelling part of the world. Some of Europe’s best Christmas markets beckon with all kinds of inspiration for Christmas gifts lovingly made in France – as well as delicious regional treats to sample as you browse the charming stalls with their artisan wares including hand-made jewellery and wooden toys. Convivial events with a family feel, they also feature illuminations, Christmas trees, visits by Father Christmas or Santa’s grottoes, and festive entertainment for parents and children alike. Speaking of food, France is world-renowned for its gastronomy, and there’s no better place than Northern France to enjoy or stock up on ingredients for a sumptuous traditional Christmas dinner or New Year’s Eve feast, whether they be salmon from Boulogne, punchy regional cheeses, famous Licques chicken or champagne directly from the region where it is grown. The world’s best and most famous celebratory drink – a must-buy for Christmas and New Year’s Eve parties – isn’t purely an affair of the big-name houses. Northern France is home to many fantastic smaller producers working with skill and passion, including the UNESCO award-winning Champagne Météyer Père et Fils in Trélou-sur-Marne, Champagne Pannier in Château-Thierry and Champagne Belin in Essômes-sur-Marne. These and many other producers on this section of the Champagne Route are open for tast-ings and tours during which you can learn all about the grapes used, the intricacies of production techniques, what a label tells you about its contents, and the best bit… how to smell and savour! the luxury treat along with other house specialities. Other names to look out for include the Ferme Les Canardises des 3 Vallées in Condé-en-Brie, the Ferme Auberge des Canards de la Germaine in Sancourt, the Ferme des Charmettes in Autheuil-en-Valois, and the Val de Luce in Thennes. 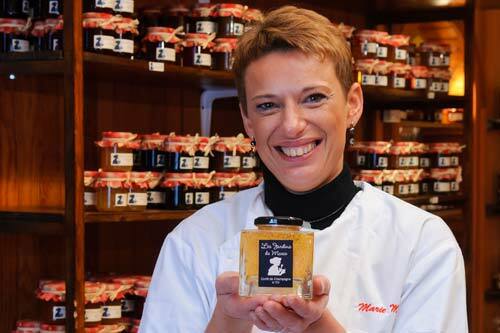 From the hands of master jam-maker Marie Maryn, Les Jardins de Marie products are also held in high esteem at the Elysée Palace. The secret to their success is the rigorous selection progress by Marie and her team, who insist on the highest quality, the best varieties – think Gariguette and Mara des Bois strawberries, Cantaloupe melons, Williams pears – and a perfect state of ripeness thanks to a local or short-distance sourcing of non-native fruits such as pineapples, passionfruits and kum-quat oranges. Most prized of all is the prestige range, made with champagne or with Sauternes with truffles. A must for Christmas and all special occasions, these delicious treats are available in an ever-growing number of wonderful chocolatiers all over Northern France, including artisan chocolate-maker Patrice Bonnotte in his shop at the foot of Amiens Cathedral, with its almost-edible Christmas window displays. 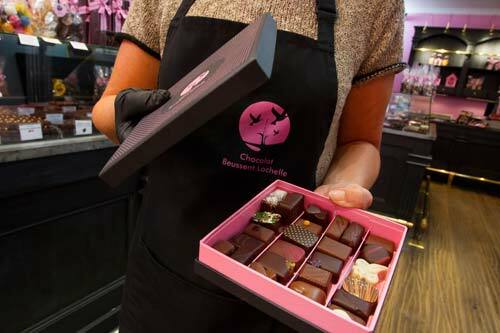 Meanwhile, Brice Canesson in Chantilly not far from Paris makes quintessentially French chocolates that you can buy in a luxurious box depicting the fairytale-like Château de Chantil-ly itself. At Le Touquet on the Côte d'Opale, Chat Bleu is a chocoholics’ favourite, while Beussent-Lachelle near Boulogne is one of the few chocolatiers in France that makes its chocolate directly from cocoa beans. Today it has 25 shops, most of them in Northern France. The ultimate sweet Christmas gifts, Chez Meerts’ waffles delight the most discerning of foodies with their fluffiness and delicious filling. 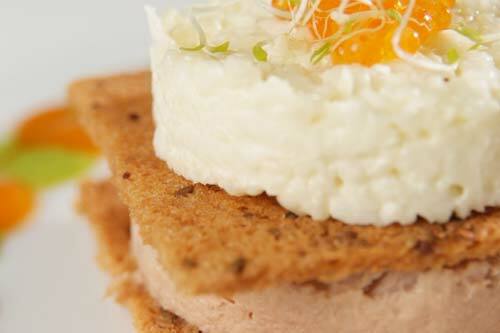 The recipe itself has been jealously guarded by the heads of this famous Lille venue since 1849. 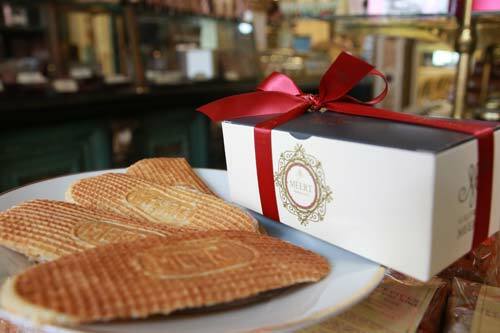 We recommend the traditional version: scented with Madagascar vanilla, hand-made with love and care and branded with De Meert’s seal, it was a favourite with Général de Gaulle at the Elysée Palace. But these days it’s also available in other flavours, including Speculoos cookies, pis-tachio and sour cherry, and blackcurrant and violet, for instance. Once inside the door, you won’t be able to resist taking a seat in its tea-room with its Art Deco window, antique counters and display cases, mouldings, gildings and copper accessories. 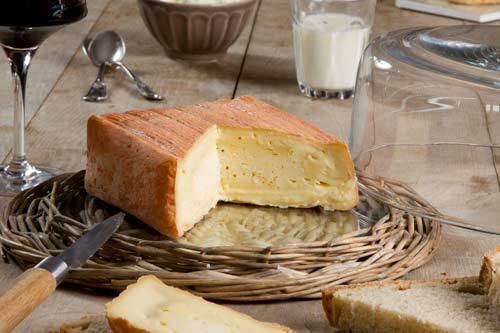 This stinky, soft cows’-milk cheese with its washed rind – a veritable regional icon – can be brought directly from the producer at Maroilles Leduc in Sommeron, where you can also see some of the production processes in action. Other great places to buy Maroilles cheese are the Boutique Philippe Olivier and the Boutique La Maison des Fromages et des Vins in Calais, and producer Claire Halleux at La Ferme de la Fontaine Orion in Haution, in the heart of rolling countryside surrounded by picturesque little villages. Here you can see Maroilles stored in a brick cellar and buy some to take away with you. While you’re Christmas shopping in Northern France, make sure to pick up some Anosteké Saison beer produced by the Brasserie du Pays Flamand in Blaringhem between Calais and Lille. In 2016, it was named the world’s best bière de garde at the World Beer Awards in the pale ale category. 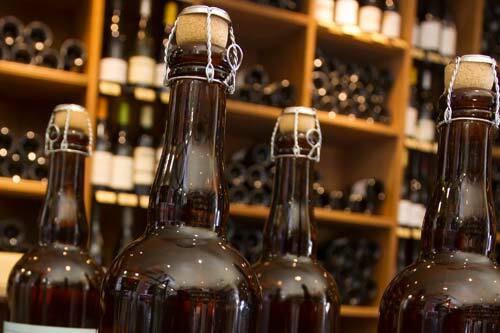 Beer-lovers will be thrilled by the different varieties of beer brewed in Hauts de France. Blond, brown, golden or amber ales, ranging from bitter to the very mild, the slightly sweet to the acidic, the light to the very strong… The choice is huge because this has long been a land of breweries. For newcomers to the world of beer, L’Echappée Bière offers Christmas gift cards for introductions to brewing or for tasting workshops. 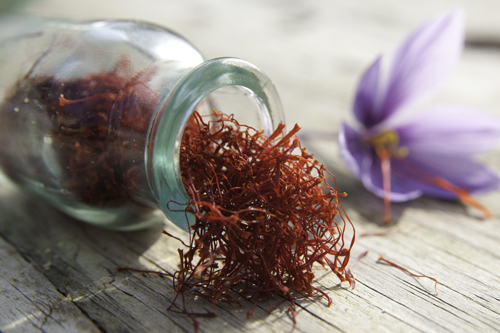 Luculus de Valenciennes saffron products. Named after a Roman general renowned for his sumptuous feasts, this truly French culinary speciali-ty with its home-cooked feel blends the delicate taste of foie gras with the robustness of beef tongue, with which it is interleaved. It was invented by Edmond Laudouar, a restaurateur from the town of Valenciennes in Northern France, and all ingredients are sourced locally. Raised in and around Calais, Boulogne-sur-Mer, Montreuil-sur-Mer and Saint-Omer, Licques chick-ens have their origins in the poultry-breeding carried out by the monks of Licques Abbey from the 18th century onwards. This excellent free-range meat is so highly regarded that it was served to Barack Obama and 150 other heads of stat at the 2015 United Nations Climate Change Conference, cooked by Michelin-starred chef Alexandre Gauthier. Meanwhile, Licques turkey was also served on last year’s New Year’s Eve at the Elysée Palace, official residence of the French president. With family origins in the trade going as far back as 1922, Maison David in the fishing port of Boulogne takes sustainably farmed salmon from Scottish lochs, famed for their tender, lean flesh. It then works them in a secret blend of salt and spices before smoking them for many hours. The result is a superlative smoked salmon perfect for your traditional Christmas dinner. It’s not all about food in Northern France. 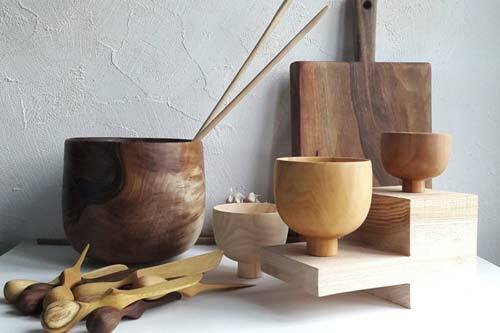 Great products made in the region to take home as upmar-ket Christmas gifts or for use in your own home include the delightful wooden kitchen utensils made by Kermesse Sauvage, which are popular with many of France’s Michelin-starred chefs for the way they bring out their dishes and add drama and poetry to dining tables. Nature is very trendy in the world of table decoration right now – and indeed, what could be lovelier than enjoying festive sharing dishes served on natural materials that were also used by our ancestors? Inspired by the region’s forests, Kermesse Sauvage’s sculptor Florence Vandenhende lovingly crafts each piece by hand, creating one-off pieces from beech, walnut, maple, cherry and ash from the forest of Crécy-en-Ponthieu right by her workshop on the outskirts of the Baie de Somme. The beautifully rendered dishes, plates and covered bowls are all authentic, organic and raw – and prices are very reasonable. Another local kitchen producer – this one very well known and popular around the world – is Le Creuset with its enamelled cast-iron cookware. Despite its global success, the firm has remained in its birthplace, the small town of Fresnoy-le-Grand between Amiens and the Belgian border – a place also known for its role in World War I, when 15 trains full of English and Scottish forces arrived here in August 1914, en route to the Battle of Mons, which was the first major action of the British Expeditionary Force in WWI. Visit Le Creuset both for tours of the production facilities and to stock up on its famous casse-role dishes and other kitchenware at factory prices. They’re fantastic for Christmas presents for ama-teur chefs who want to up their game – as attested by generations of home cooks, many of our grandmothers among them, who used them for sauces and other dishes the very smell of which evokes a heady nostalgia. 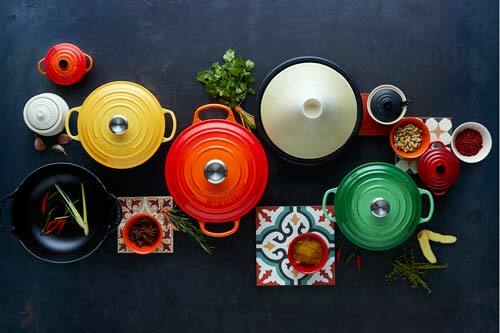 But Le Creuset has kept up with the times too, re-launching existing prod-ucts in an ever-growing range of bright colours, modernising its design and bringing out new collec-tions, all of impeccable quality. The kitchen aside, other great Christmas present ideas based on the region’s products in-clude Calais-Caudry® lace. Undeniably chic and glamorous, this delicate and luxurious fabric with deep roots in Northern France counts among its fans Grace Kelly, the Duchess of Cambridge – who wore it at her wedding – Michelle Obama and Hillary Clinton. It’s been produced by generations of expert artisans on historic Leavers machinery – 80% of which can be found in the Calais–Caudry area. Each of these towns has its own museum complete with a boutique where you can’t fail to find a special Christmas gift, whether it be a dress, a blouse, mittens, a stole, a hat, a bag, or a ta-blecloth or other table settings. Or for something more elaborate or tailor-made, simply ask staff as they will happily recommend local producers.